This entry was posted in Uncategorized on October 27, 2011 by Anthony Hutton. A magazine is an iPad that doesn’t work! This entry was posted in Uncategorized on October 26, 2011 by Anthony Hutton. This entry was posted in Uncategorized on October 24, 2011 by Anthony Hutton. Diameter, weigth, width of wheel, width of wheel at ground surface, height of drop, resistance on the ground, number of parts, durability of wheel in a fall, friction at the rolling surface. Quality of Concept, build quality, simplicity, logical, correct balance of relative sizes, quality of materials. What makes a winning design? What is the list of requirements for this project? This entry was posted in Uncategorized on October 19, 2011 by Anthony Hutton. Listserve host a discussion group called PhD Design. In that group the characteristics of PhD in Design are discussed: Should there be such a thing as a Phd Design? If there is, what should it involve? What is the balance between practice and theory in a PhD Design? Should designers simply design to advance themselves rather than working on a PhD? Etc. for me, I dont know who is right, but I do think its wonderful that it is being discssued with such vigour. I would refer back to my definition of design spider diagram. In it “design is creative” is marked as a thing that happens sometimes, where “design is rational” is marked as a characteristic. I suppose I might have made “design is rational” as a thing that happens sometimes on par with creativity. Alternatively I may have reversed the emphasis entirely. I think that Dr Love raises a very interesting point in so far as he suggests that the emphasis is changing due to the massive abundance of information. He may be entirely wrong where the abundance (overload) of information only heightens our desire for the intuitive and creative? This has to balanced with the nonsense that people talk as they get in contact and harmony with their creativity…ffs. This entry was posted in Uncategorized on October 17, 2011 by Anthony Hutton. 2. 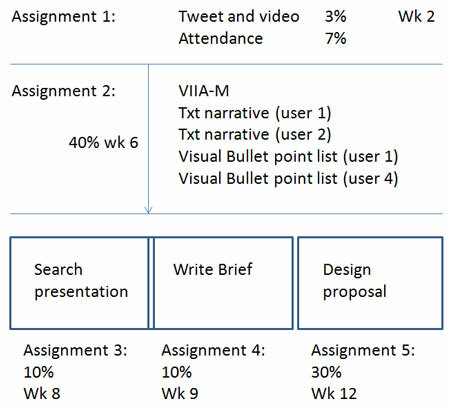 A highly visual bullet list of the key VIIA-M points of interest as described in the text narrative. The essay and visual bullet point list should be presented on A4 paper and mounted on a display board in MQ213. This entry was posted in Uncategorized on October 13, 2011 by Anthony Hutton. this change is due to a university meeting that I need to attend. This project is a team based competitive design challenge. It is designed to test your ability to reach a design solution and build a prototype featuring optimum performance for a specified task. 3. Materials acquisition: Leads the effort to get the material required for building the wheel. 4. Building Director: Leads the process of building the wheel, ensuring quality of build and on time delivery. Design a wheel which wins the competition where the winner is the wheel that travels furtest multiplied by the diameter of the wheel (there is an incentive to go large). The wheel should roll down the ramp and continue having been eased over the side by a feather touch and travel according to its own momentum derived from the gravity drop experienced on the slope. This entry was posted in Uncategorized on October 11, 2011 by Anthony Hutton.